Results of the longitudinal survey of 2010/11 graduate destinations released today. A sample of graduates who left higher education in 2010/11 were asked what they were doing on 24 November 2014. 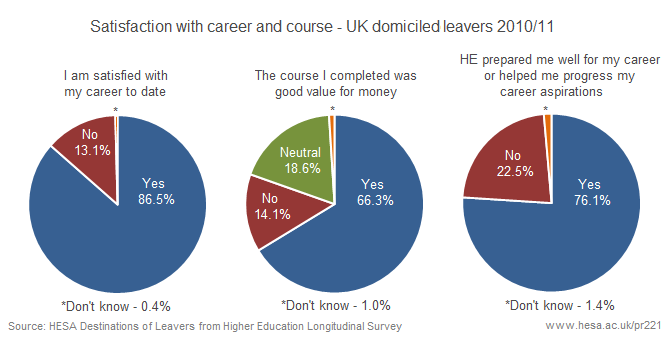 Two thirds (66%) thought their course had been good value for money [Table 20 from the free introduction]. The full report of the survey results is available on our website. Summary results and charts can be found in the introduction. 87.9% of UK domiciled leavers surveyed were in employment 3½ years after graduation. 6.0% were in further study only and 2.6% were unemployed. When the same respondents from the cohort were surveyed 6 months after graduation, 76.6% were employed, 11.6% were in further study only and 8.0% were unemployed. The graphic shows the activities of leavers at each survey stage, including the flows between activity types. Overall 73.6% of those who were not working after 6 months (whether studying, unemployed or other) were in work after 3½ years. Meanwhile, 7.7% of those who were in work after 6 months were doing something other than work in November 2014. The smaller graphics show the proportions for each activity separately. Of those were unemployed after 6 months, 79.2% were in work after 3½ years, but 9.4% were still unemployed, or unemployed again, in November 2014. Of those who were in further study only 6 months after graduating, nearly one in five (18.9%) were also in further study only after 3½ years. Chart 4 in the introduction and tables 5, 10 and 14 in the full report give more detailed comparisons of the early and longitudinal survey results. The longitudinal survey has been carried out every two years since 2006. The latest survey shows an increase in the proportion of UK domiciled leavers employed and a decrease in the proportion in further study or unemployed compared to the 2012 survey of leavers from 2008/09. The unemployment rate has fallen back to the same level as for 2004/05 leavers when they were surveyed in 2008. Table 1 of the full report provides a time series broken down by level of qualification and domicile. The full report for each year's survey can be found here. The survey included qualitative questions about graduates' opinions and levels of satisfaction. 86.5% of UK domicile leavers said they were satisfied with their career to date. 76.1% thought that the course they had completed in 2010/11 had prepared them well for their career. 66.3% agreed that their course had been good value for money. More detailed results for the opinion questions can be found in tables 20 and 21 of the full report. The median salary of UK domicile leavers from 2010/11 who were in full-time paid employment in the UK was £26,000 pa after 3½ years. This compares with a median salary of £22,000 pa at the 6 month early survey. Tables 11a to 11c of the full report provide salary data broken down by level of qualification, subject and gender. The introduction to the publication includes further charts summarising various aspects of the survey results. The Survey was completed by 81,650 leavers who had previously completed the Destinations of Leavers survey six months after graduating (a 31% increase in respondent numbers over the previous longitudinal survey). The six month survey was completed by 396,650 leavers out of 526,225 eligible qualifiers from the 2010/11 cohort. Alluvial diagrams created with RAW from Density Design.